I have an assignment to draw rectangles that get larger and larger each time I draw them. Just like shown below. I've labeled them TL = Top Left, TR = Top Right, BL = Bottom Left, BR = Bottom Right. The smallest boxes are 8 pixels by 8 pixels. 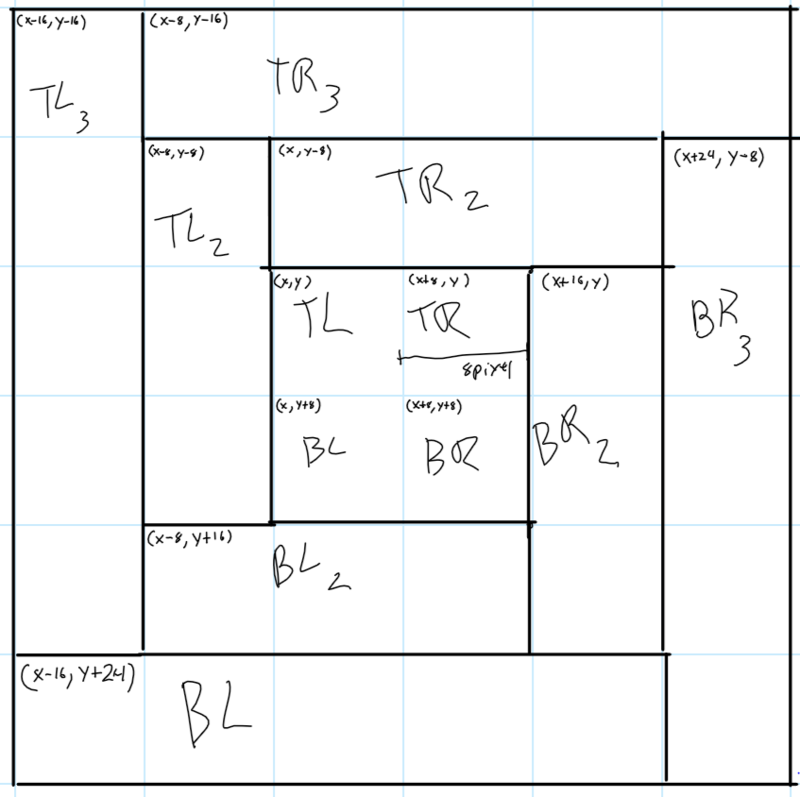 From this drawing I pulled these algorithms for each box. Where n represents the level you are drawing. Level 0 is the inside set of four and grows out by 1. My real questions is this. I feel like I can combine these algorithms into something smaller but I'm new to this type of thinking. This is the first Computer Science Class I've taken that required me to do this type of thinking. Do you have any suggestions? From these algorithms I wrote this code in Java. //all squres are based off an 8 pixel system. I use this to shift things around ALOT. height*dcg);//Height. This stays at 8 for all iterations. Here is what my final product looks like right now. Disregard the triangle shapes that a different method that calls the first one multiple times. This is my first quarter learning Java and I'm new to programming. I would call this drawRectangles, as it draws four rectangles on each iteration of the loop. Also, that leaves room for a drawRectangle method. 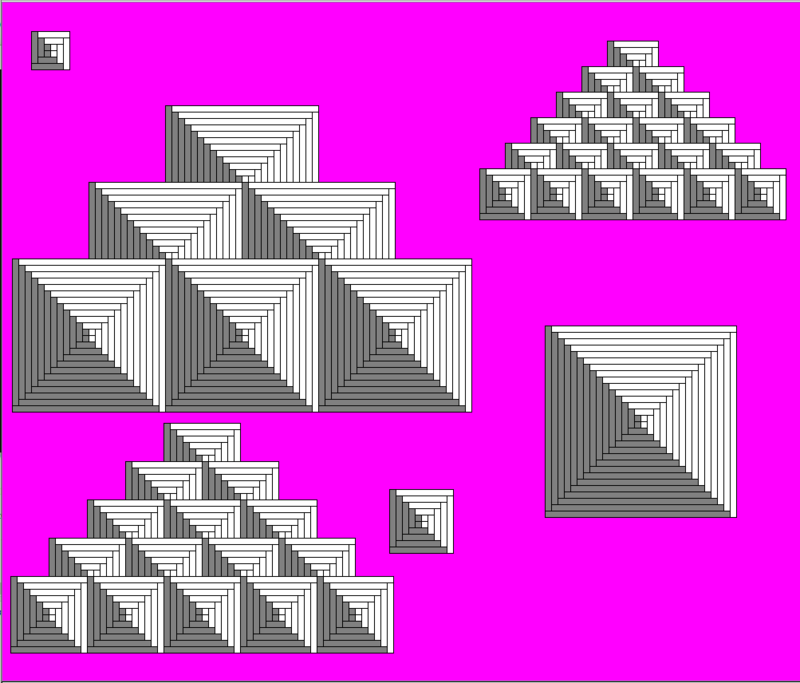 // all squares are based off an 8 pixel system. I use this to shift things around A LOT. And it doesn't put a scroll bar on my StackExchange screen. This assumes a previous change of width and height to narrow and small. We still have width and height in the helper method. Add right and bottom with them, outside the loop. This is both shorter and more readable in my opinion. Rather than recalculating everything as needed, it calculates everything once. By using these names, we can easily see that a particular rectangle is the "left, top" that is drawn gray in "narrow, tall" aspect. We don't need comments, as these names are self-documenting. We can make all of these final, but you don't need to do so. I eliminated dcg. It was confusingly named and as I looked at it more carefully, unnecessary. You could also make things easier by changing this from a static (class) method to an object method. Then your constructor could take a Graphics object. That would save passing it around all the time. You don't provide enough context to say whether this is a good idea. This might require moving this method to a different class. I would add an underscore to CHANGECONSTANT and call it CHANGE_CONSTANT. Or change the name to something else entirely, e.g. INTERVAL or STANDARD_DIMENSION. You haven't provided driver code; I haven't tried to run this version to see if it gives the same behavior. Beware of errors that might have been found by running the code. Not the answer you're looking for? Browse other questions tagged java beginner algorithm homework graphics or ask your own question.